Set out on an African safari in style. You’ll be glamping in luxury accommodation, enjoying the finest wines in the evenings and encountering Africa’s most exotic creatures by day. You’ll visit the Okavango Delta, Moremi Game Reserve and Nxai Pan National Park. This is certainly a bucket list trip. When you arrive at O.R. Tambo International Airport you’ll be transferred to your 5-star hotel. You’ll meet your fellow travellers and tour guide over an evening meal. This morning we’ll fly to Maun in Botswana and then transfer to Leroo La Tau in Makgadikgadi Pan National Park. At this park you’ll be able to observe the second biggest animal migration in Africa while staying in luxury accommodation. We’ll get the chance to meet some of the animals as we take a trip to Nxai Pans National Park. Here we’ll find oryx, eland and springbok. Our luxury lodge is located on a cliff overlooking Boteti River – you may well see zebras and elephants strolling by. We’ll be taking game drives, boat rides and having the perfect African safari experience. Today we’ll fly to Okavango Delta, the world’s largest inland water system. Prehistoric earthquakes have created magical Okavango Delta, where rivers flowing through Africa meet in Botswana. We’ll head out for mokoro rides and walking excursions and see the wonderfully named birds: Pels Fishing Owls and Wattled Cranes. 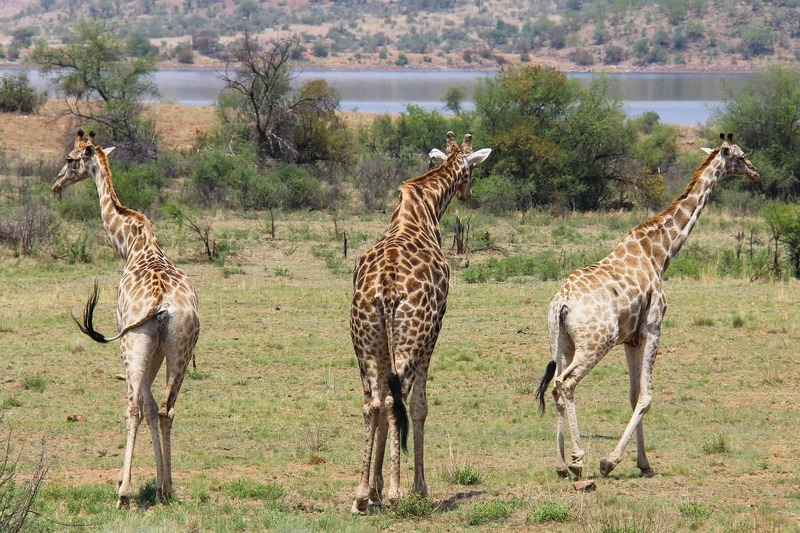 Over 600 species can be found here including zebras, baboons, warthog, buffalo and red lechwe. We’ll be glamping in style in East African style tents with en-suite showers and sundecks. At night we’ll share food and stories over a camp fire. Today we’ll fly to the Moremi Game Reserve where we’ll see some of Africa’s finest wildlife – elephant, buffalo, kudu, hyena and sable and roan antelope. We’ll be staying in an Okavango lodge – this will be a classy glamping experience. Think candlelit dinners and fine wines. Expert guides will take you through the reserve and teach you about the exotic creatures that call this place home. We’ll transfer back to Johannesburg for our return flights.